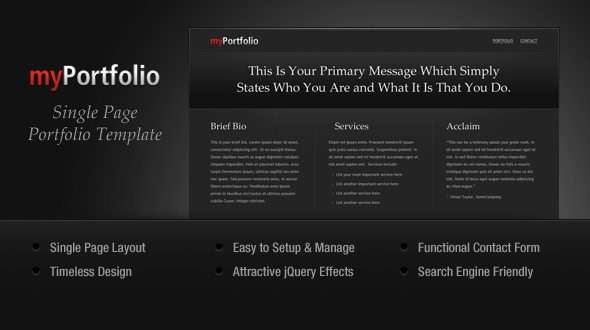 myPortfolio is a thoughtfully crafted sing page portfolio template that gives you all you need to showcase your work and clearly communicate your offerings. The HTML code is efficent and well structured which makes it simple to customize and easy for search engines to index. The download comes with a full list of materials, including numerous Photoshop files and a detailed help file, to help you customize and launch your own professional online portfolio in no time.